Input Devices, Volume 1, Computer Graphics: Technology and Applications focuses on the technologies used in equipment and systems for computer graphics and discusses the applications for which computer graphics is intended. This book explores the combinations of software and hardware that make up the operating systems. 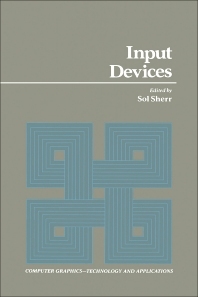 Comprised of seven chapters, this volume starts with an overview of the popular examples of input devices that are used in computer graphics systems, including typewriter keyboard, the mouse and voice input, data input panels, digitzers, and touch input panels. This book then proceeds with a discussion of the general requirements for input devices. Other chapters consider the various panel input devices that are popular means of allowing the user to interface with the computer graphics system. The final chapter deals with voice input systems, which is a technique that has not fully achieved its potential. This book is a valuable resource for designers and users of computer graphics equipment and systems.